Do you spend hours while surfing internet just because you are unable to digest all that information? Presence of infinite information on internet is great in terms of benefits but it becomes a headache at times when you are in need of a specific, to the point answer. You end up having cluttered information, making it impossible for you to filter results that you desire. The solution to this frustration is simple in the form of advanced search. Advanced search will provide you results in a customized manner as opposed to basic search where there is loaded information. In this time of variety, where every user has their own set of requirements and choice, advanced search provides you custom settings to obtain results as per your need. Here I am listing some of the amazing uses of advanced search and the search options for some famous search engines to ease your pain and save your time while surfing. How advanced search is helpful while surfing? Do you end up with irrelevant information while searching on net, advanced search has the solution for you by filtering specific information. If you are seeking information particular to certain event, person or place, advanced search will do this for you. Instead of going through unnecessary results, advanced search narrows down the results by eliminating irrelevant ones. You can reach out to specific sites by putting up exact words for domain suffixes such as edu. or gov. for education and government sites respectively. Advanced search enables you to obtain specific type of file formats such as pdf, word, PowerPoint and several others to give you exact results for spreadsheets, research papers etc. This option of advanced search helps you to get facts from certain sites in no time. 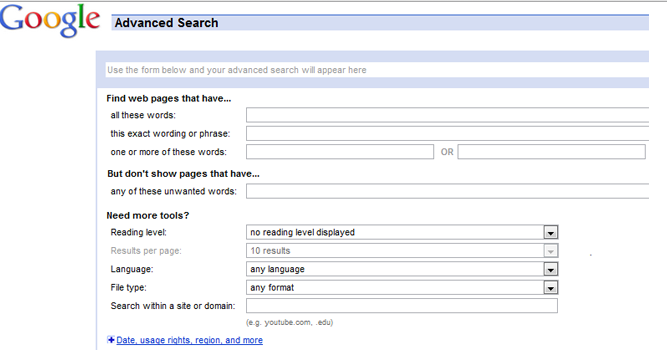 It also gives options to set range for number of search results giving you the control to limit or widen your search. You can also search by region to limit results in order to get updates or information from a specific location. With Google advanced search, you can put quotation marks around the word or pharse you want to search to get a focused, to the point result. You can even set your reading level on Google advanced search to set the comfort level for you. It also enables you to set that the terms you search should appear in the URL, title or links in the page. Search engines like Yahoo and Google give you options to search information from particular web sources as well. Similarly twitter advanced search can filter tweets from a specific person on a specific date and even enables you to filter tweets with certain moods as well. This precision lets you cut down the amount of information that is otherwise available. For image sites such as flickr and tumblr, advanced search gives you options to filter images for free and commercial use that enables independent site owners to use free stock images to use. The unnecessary results such as advertisements and irrelevant details cost more time and energy. However with advanced search, you can skip unnecessary information by giving directions in ‘not to include’ section. You can weed out irrelevant websites too by this option. If you do not want your search engine to show your results from years back and stick to the recent updates, you can use advanced search to limit your result to a specific date or to latest only. Google advanced search has the option of narrowing down result by language, region, latest update and web page. It also gives you access to exclude sites with explicit material in order to provide you with a safe search. A research conducted by Chitika Insights (an online advertising network) says that only 6% of the users bother to see second page of Google results. The reason is the short amount of time people have and the urgency to get results. No doubt, first page of search engine results provide the highest ranked sites but they are not always suitable for each individual. Advanced search customizes the results according to your choice by choosing specific words/phrases from the existing database. It presents the results particular to our requirement instead of leaving us with the clutter to organize ourselves. Whether you are a student, a business person or a journalist, advanced search is equally helpful for all due to its time-saving nature. By eliminating unnecessary results from your search, it helps you to be more focused towards the work at hand. Sifting through lot of information leaves you lethargic and inactive to complete your task. So, advanced search gives you opportunity to give your complete attention to the required field instead of ending up to spam sites and advertisements. The option of advanced search certainly helps search engines to increase users by giving focused results and increasing relevance. This has become a great need for users as well to acquire efficiency in their work. Due to cluttered and unorganized information over internet; users have a hard time searching and getting appropriate results. The unlimited flow of information has also left audience with lack of analytical skills because they spend a lot of time consuming the information and less time on comprehending that information. With advanced search, internet surfing can be easier and time-efficient so that users are not stuck with unnecessary, irrelevant information and are able to get coherent set of information only. This will allow users to save time and get maximum output in limited time.